After a month-long break, Diamond League action is back this weekend and Saturday’s Müller Grand Prix Birmingham is the last stop in the series ahead of the two finals in Zurich and Brussels. The stacked fields include a women’s 200m where all eight athletes have sub-22.20 PBs and a men’s 100m featuring world leader Noah Lyles, his fellow American Christian Coleman and Britons Zharnel Hughes, Reece Prescod, Adam Gemili, Nethaneel Mitchell-Blake and CJ Ujah, plus a women’s pole vault including Olympic, world and European champion Katerina Stefanidi, US world indoor champion Sandi Morris and Britain’s European bronze medallist Holly Bradshaw. With a packed programme of action ahead, here we highlight just some of the events on offer. See the August 16 edition of AW magazine for a timetable and interview with Lyles and keep an eye on our website and social media channels for updates. All eight of the athletes on the entry list have gone sub-22.20 for 200m, led in 2018 by Britain’s Dina Asher-Smith. The 22-year-old current AW cover star stormed to a superb sprint treble at the European Championships in Berlin, winning the 200m title in a world-leading and British record-breaking time of 21.89. 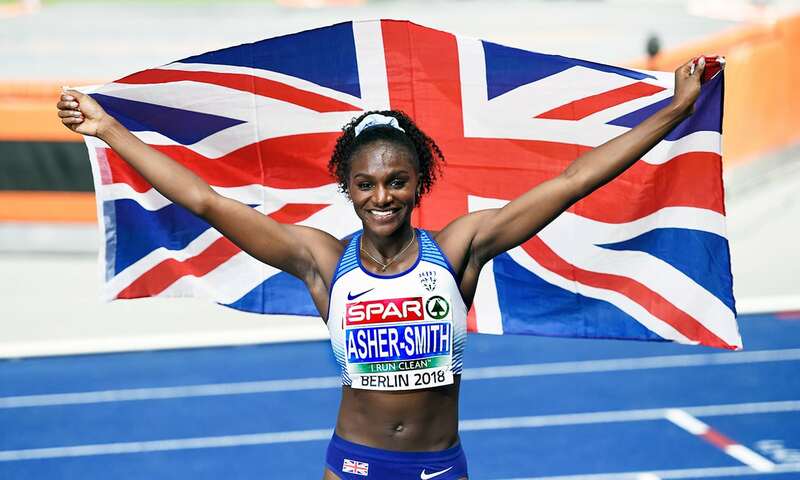 Fans will be eager to see what the Blackheath & Bromley sprinter can produce this time, when she lines up alongside the likes of Ivory Coast’s double world medallist Marie-Josée Ta Lou, two-time world 200m champion Dafne Schippers of Netherlands and Olympic 400m champion Shaunae Miller-Uibo of Bahamas, who is unbeaten in 2018. “It’s more like an Olympic final tomorrow! I’m really excited,” said Asher-Smith at the pre-meeting press conference. "We don't avoid each other, we always turn up"
Christian Coleman was denied the chance to take to the Olympic Stadium track last month when hamstring trouble ruled him out of the Müller Anniversary Games but he’s set to return to Diamond League action in Birmingham. Two heats and then a final will see the world indoor 60m record-holder joined by his fellow American Noah Lyles – the world leader with a mark of 9.88 who is racing in the UK for the first time – plus South Africa’s Commonwealth champion Akani Simbine, Jamaica’s Yohan Blake, Britain’s European gold and silver medallists Zharnel Hughes and Reece Prescod, European 200m silver medallist Nethaneel Mitchell-Blake, last year’s Diamond League champion CJ Ujah, Adam Gemili, Ojie Edoburun, Harry Aikines-Aryeetey and Samuel Gordon. "With great competition comes fast times"
Katerina Stefanidi of Greece gained another European gold in Berlin, adding to a CV which also features Olympic and world titles. She goes up against USA’s Sandi Morris, back in the city where she claimed the world indoor title in March, with the pair having cleared 4.85m and a world-leading 4.95m respectively this season. New Zealand’s Olympic and Commonwealth medallist Eliza McCartney has cleared 4.94m this summer, while Britain’s Holly Bradshaw will also be looking for another strong performance after coming close to her own national outdoor record with 4.80m last month and winning a medal at the European Championships. With his retirement from competition looming, Britain’s grand-slam long jump champion Greg Rutherford will take to the Alexander Stadium runway for the final time. Further injury struggles meant the 2012 Olympic and 2015 world gold medallist missed the defence of his European title in Berlin but he returns to competition in Birmingham for a farewell IAAF Diamond League meeting contest. He’s up against some strong opposition, with South Africa’s world champion Luvo Manyonga in the field. He has jumped 8.58m this summer, while Greece’s European champion Miltiadis Tentoglou is also in action after his 8.25m in Berlin. Cuba’s world indoor champion and world-leader Juan Miguel Echevarria won’t be joining them due to injury. Fresh from gaining 1500m gold in Germany, Laura Muir targets Dame Kelly Holmes’ 21-year-old British 1000m record in Birmingham. The 25-year-old, who broke Holmes’ national 1500m record in 2016, hopes to make further history by beating Holmes’ 2:32.55 in front of a home crowd. Joining Muir in action will be her fellow Brits Adelle Tracey, Jemma Reekie and Katie Snowden, plus France’s European 800m silver medallis Rénelle Lamote. "In Berlin I ran the last KM hard, so that was good prep … I feel on target to go for it"